You are going to love today’s idea! This one really did help me get ahead. I turned out so many pretzel bites, we ate on them all day, then I was able to stash some in the freezer too. This recipe is more time consuming than the other easy snack recipes I’ve shared. But trust me, these are worth the extra work! I didn’t stop and count how many pretzel bites this recipe makes (for obvious sanity reasons), but I would say this recipe would fill a two gallon ziplock bag and then some. Yep! You’ll get ahead with this recipe for sure! In a large bowl, mix 1 cup warm water, yeast, and 2 teaspoons of honey. Stir this together and allow it to sit. Meanwhile, heat butter, milk, 1/2 cup honey, and salt in a medium saucepan on the stove until mixture has reached 120°. Stir contents in saucepan into the yeast mixture. 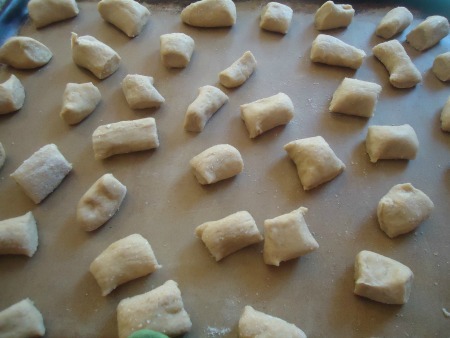 Begin adding flour, two cups at a time until a nice dough has formed. Knead for 3-4 minutes. Place dough in bowl, cover, and allow it to rise for 1-2 hours. 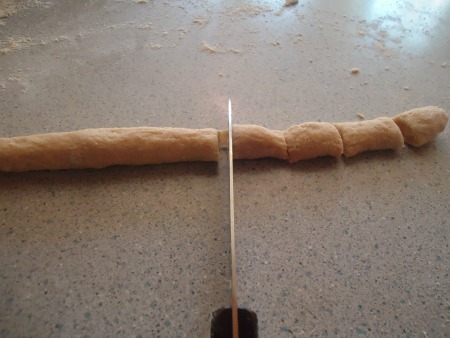 On a well floured surface, roll fistful sized balls of dough into “snakes.” Cut into one inch bites. Place on a baking sheet or stone. No need to allow for rising time, but if they sit there a while, that’s okay too. Bake in a 350° oven for 15-20 minutes or until golden brown. 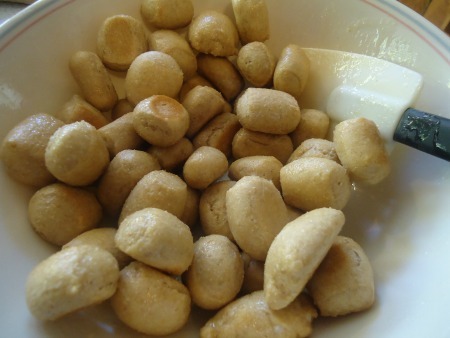 Place baked pretzel bites in a bowl, drizzle on some melted butter, toss until coated, then sprinkle sea salt and toss again. Serve warm, serve cold, or cool and freeze the bites in a freezer bag for up to three months. Thaw and reheat in the oven. I experimented with a Nacho Cheese Dip for these pretzel bites. Check it out here! 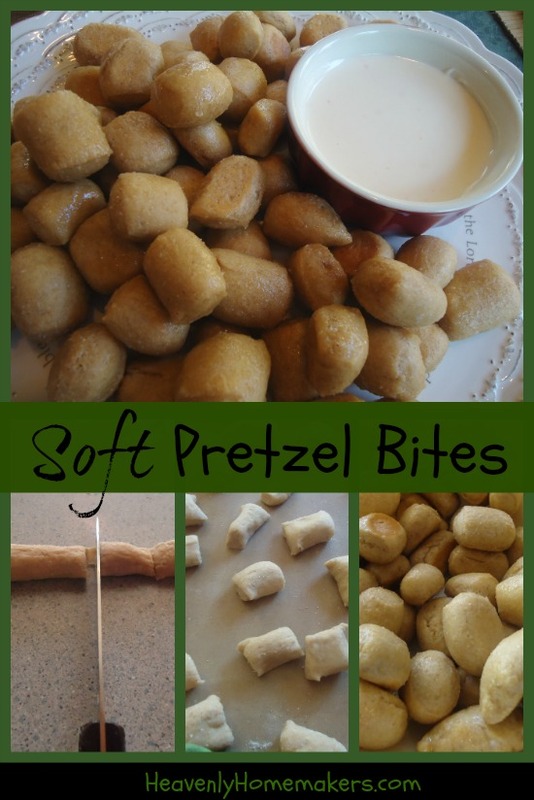 Give me more dipping ideas for these soft pretzel bites!! How about a sweet glaze of powdered sugar, milk, and vanilla…. or a honey mustard??? My thoughts exactly! I was thinking of the honey mustard that Laura has listed on the site- yummy!! How many pkgs. of active dry yeast would that be? It seems like a lot of yeast. You know what would really set these apart and make them actual pretzels? Boiling them for 30 seconds in a pot of water that has had 1/2 cup of baking soda added to it (after the final rise and before baking). It would probably only add 5 or 10 minutes of extra active time onto this project. That step is what sets pretzels apart from baked dough. Just a thought! Ooooh! These look yummy! You’re posting too many good-looking snack recipes. :) I want to try them all right away! Sounds yummy! Can’t wait to try these. Another idea is sprinkle and toss with cinnamon and sugar. These look yummy…if you ever feel adventurous and figure out a gluten free version, please let us know! i have so dearly missed pretzels since going gluten free due to celiac (it is probably the only thing that I have not have any substitute for :-( ). Try dipping them in Spinach dip! A Priest at work makes them for the employees 2 times per year and they are served with cheese sauce and spinach dip! Yummy! Ooooh! I’m so excited to try to make these for my little ones. Maybe try sprinkling them with a cinnamon-sugar mixture! I also thought of mustard as a dip,but what about stone ground di-jon? Maybe a mixture of mustard with a dash of mayo. Can’t wait for your macho cheese dip recipe. My kids and I made these up for a tasty afternoon snack. We decided to try a few boiled like Mrs. Cookin suggested, and a few just baked. After they came out of the oven, we had a quick taste test. The boiled ones won hands down. I definitely agree that it’s worth a few extra minutes to take that step. They sank initially, and then bobbed to the surface. We pulled them out once they floated, and baked as you directed. The bites were delicious! I mixed up a quick ranch style dip (mayo, sour cream and some organic season salt). They made a mighty fine combination. This recipe made a bunch! I ran out of time for baking, so took the last couple dozen and am flash freezing them after boiling. I’ll transfer them to a Ziploc and keep in the freezer. Should be good to pull out in a few weeks and bake. Glad it worked out so well! We love soft pretzels at our house too! I think you plan of freezing right after boiling is perfect! Because fresh baked pretzels are always better than re-heated pretzels! Hummus! These would be AMAZING with hummus! 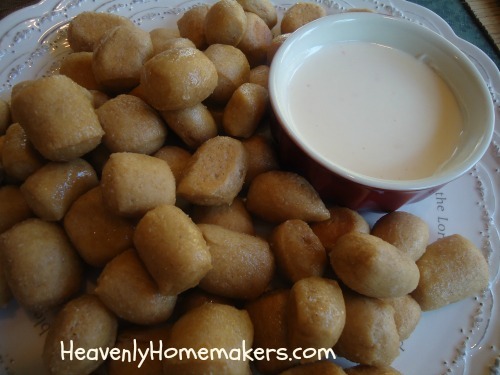 The farm that I buy my honey farm, makes a wonderful honey mustard pretzel dip that I bet will be wonderful with these… SO making these!!! Well the family had fun rolling them out but they really did not taste good. Nothing like Auntie Ann’s at all. They are destined to be our dog’s biscuits this week. I will keep looking, or better yet I will just buy wait till we get to a mall. OMG!!!!! I made these as a snack for our church small group (boiled them before baking per reader comments). The group is lucky any made it there. :-) They are AWESOME!!!! Could you use instant yeast for this, or just active dry? i just made half a batch and thought they were great. i did end up doing the boiling method with baking soda before baking. taste and smell like pretzels to me! thanks for the recipe! I’ve wanted to make these since the first day you posted the recipe. Finally last night I got to make them and they did not disappoint! This recipe makes plenty too. Perfect to freeze some and eat some. We are snowed in today and decided to try these. Boiled and baked…they are amazing!!! My oldest said they are better than what you get at the mall! My plan is to freeze some, but I don’t know how many will be left. What happened to the nacho cheese dip recipe to go with these? I have been thinking about these all morning, and was going to make them with lunch. The recipe is not available! Argh! I happened to be making these today & saw your comment. This should be the nacho cheese dip recipe: http://heavenlyhomemakers.com/easy-homemade-nacho-cheese-pretzel-dip. I hope that helps! I love your website all the recipes are great. My daughter takes this to school as a snack and it always all gone. When she takes it to school I send some cheese cubes to go with it. Not sure what I did wrong but I had to throw my dough away, it never rose. I covered the bowl with saran wrap and waited a few hours to find that it was the same size but very dense. No rising at all. Very disappointed kids!